I started this project by focusing on key statistics from Google Analytics, users spent 3 minutes by filling all important information without submitting the car advert. Mobile drop off - 60% from 55% users. Desktop drop off - 45% from 37% users. Should communicate the current location: Where am I? Are you considering buying a newer car? How often do you use Carzone site? 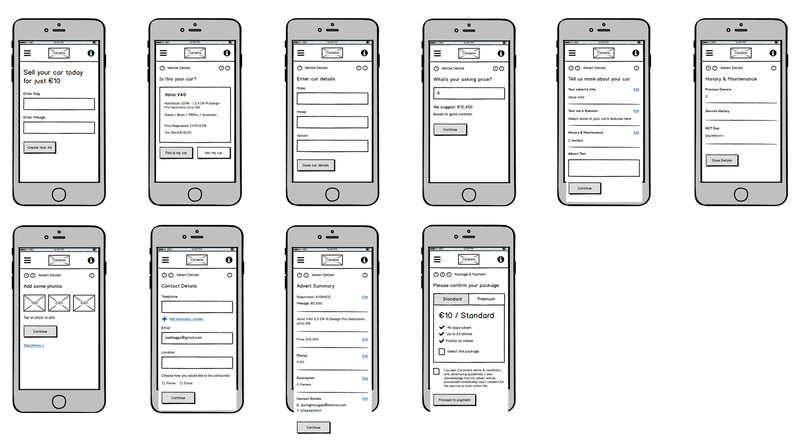 After the user flow draft, I began with mobile first wireframes and after I was happy with the results I worked with the desktop version. I conducted a few user testing on a very early stage by printing the wireframes and ask users to complete the task. That was a very good experience, I learned that our users focused more on the process rather than design.